The Eiffel Tower did not display the Russian colours after ISIS claimed the October 2015 crash of a Russian airliner after leaving from Egypt’s Sharm el-Sheikh airport, the result they stated of a bomb they placed, killing all two hundred and twenty four passengers. ISIS mass murders in Africa are mostly ignored. “On Tuesday night I gave the order for British forces to take part in military action in Iraq. “Tonight British servicemen and women are engaged from air, land and sea. 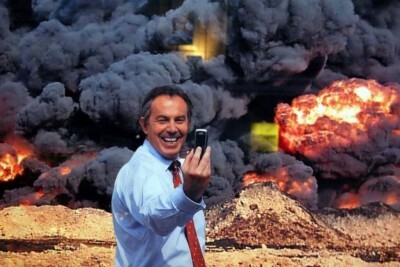 “Their mission: to remove Saddam Hussein from power and disarm Iraq of its weapons of mass destruction”, said Blair. Breathtaking. Little Britain’s “mission” was to remove from power the President of a country whose “sovereignty and territorial integrity” was guaranteed by the UN. As for “weapons of mass destruction”, probably millions of words have given the lie to their existence and to both the US and Britain’s near certainty that there were none after near ten years of exhaustive work by the UN weapons inspectors. “ … this new world faces a new threat of disorder and chaos born either of brutal states like Iraq armed with weapons of mass destruction or of extreme terrorist groups”, stated the would be Butcher of Baghdad. “Both hate our way of life, our freedom, our democracy. “My fear, deeply held, based in part on the intelligence that I see is that these threats come together and deliver catastrophe to our country and our world. The world, of course, faced no threat from Iraq. Even Iran, with which Iraq had fought the horrific 1980-1988 – with both the UK and the US arming both countries and profiting handsomely from the blood, heartbreak and destruction both sides of the Iran-Iraq border – stated repeatedly that Iraq posed them no threat. As for hating “out way of life, our freedom, our democracy”, until the embargo was imposed on Iraq in August 1990, Iraq contributed £ millions to the British and US economies sending post-graduate university students to gain further degrees in the West, ensuring an educational broadness in the advantage of studying in both academic spheres. Visiting homes of those with the money to travel it usually just minutes before the photo albums were produced showing joyful holidays in the UK, US and across Europe. There were of course, near no Middle East allied “terrorists … destroying” entertainment venues, metro stations, commercial centres until the Iraq invasion. Attacks in Europe were near always home grown separatist groups usually feeling victims of historical injustices. Lessons are clearly never learned. 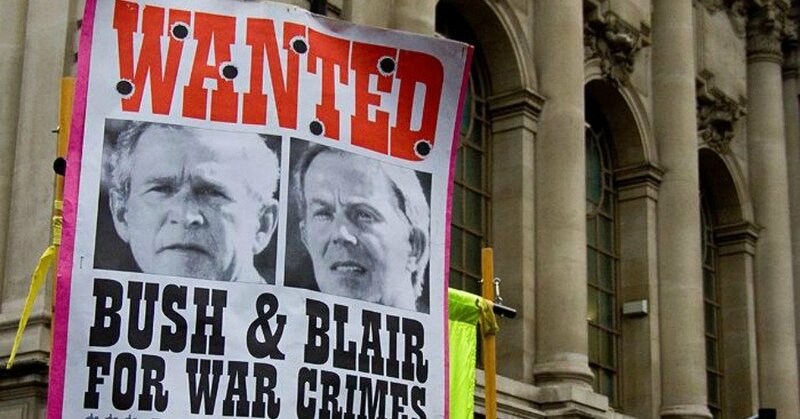 There is, however, the darkest irony in Blair’s fears that: “ threats come together and deliver catastrophe to our country and our world.” His and Bush’s actions have delivered just that. 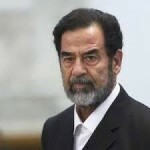 Saddam Hussein and fundamentalism were two different planets and any inkling of a threat was instantly dealt with – yes, sometimes brutally, but Iraq and the region remained secular and apart from the domestic problems and criminalities common to near all nations, the streets safe and life normal. In Baghdad, until the deprivation and desperation wrought by the 1990 embargo and the 1991 bombing people did not even lock their doors. “Should terrorists obtain these weapons now being manufactured and traded around the world the carnage they could inflict to our economies, to our security, to world peace would be beyond our most vivid imagination”, Blair continued. Indeed. The US-UK spawned ISIS who obtained arms from the US disbanded Iraqi army, arms from the US provided and trained new Iraqi army as they fled multiple conflicts in multiple areas, leaving all behind and indeed have “obtained these weapons” which have been dropped from the air to them on multiple occasions – by the US. Ironically his infatuation with George W. Bush and the “dodgy dossiers” produced under his premiership to attempt to justify the legally unjustifiable, delivered exactly that of which he warned. The result of “removing Saddam” (read: lynching Saddam) has been a blood soaked daily litany for thirteen years. The majority of Iraqis in exile fled to send money back home to keep their families and extended families during the decimating embargo which had resulted in basic food stuffs increasing in price often over eleven thousand fold. 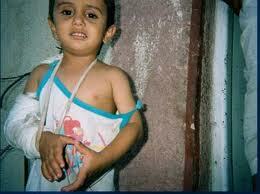 The “thousands of children” were indeed dying “every year” – from “embargo related causes” according to the UN. The government set up a ration distribution system to try and counter the food crisis (Iraq had imported 70% of near everything.) The UN called the efficiency of the system exemplary, but the embargo prevented food and essential imports. Even soap, toothpaste and shampoo and sanitary requirements had become luxury items. Prior to the embargo, the country had free health service, food was inexpensive and plentiful and water borne diseases mostly eradicated. Between the embargo and the bombing all was destroyed. “I hope the Iraqi people hear this message. We are with you. Our enemy is not you but your barbarous rulers. “Our commitment to the post-Saddam humanitarian effort will be total. “We shall help Iraq move towards democracy and put the money from Iraqi oil in a UN trust fund so it benefits Iraq and no-one else.” Never in the field of human conflict have so many lies been told to so many by so few – to misquote Churchill. Now to the nub of the statement: “Neither should Iraq be our only concern. “As so often before on the courage and determination of British men and women serving our country the fate of many nations rest.” Usually, when the British and US get involved “the fate of” the people of nations lie in mass graves. “President Bush and I have committed ourselves to peace in the Middle East based on a secure state of Israel and a viable Palestinian state.” Ah, as ever about Israel. Saddam sent aid to Palestinians, displaced, bereaved, desperate and to families of those enough so to even relinquish their lives. The demonized, also secular, President Assad, of course, also supports the Palestinians. Saddam Hussein and al-Qaeda again linked together. The former never threatened the world, al-Qaeda’s offshoot ISIS, non-existent in Iraq under Saddam, now threatening the Middle East, Europe, the US, and Africa. 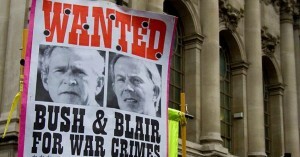 Blair was not alone making it up as he went along, singing to his pal Bush’s hymn sheet, he was also singing to that of Benjamin Netanyahu, who six months earlier (September 2002) had assured the US Congress: “If you take out Saddam’s regime, I guarantee you that it will have enormous positive reverberations on the region… The task and the great opportunity and challenge is not merely to effect the ouster of the regime, but also to transform the region.” (3) It has certainly done that. The Cradle of Civilization is now a valley of tears, widows, widowers and orphans. President Nobel Obama has commemorated the 20th March anniversary by sending more troops to Iraq and by the US bombing of Mosul University, killing around ninety people and injuring up to one hundred and fifty Including Professor Dhafer al Badrani, Dean of Computer Sciences and his wife. On 26th March 26th March forty one people were killed and one hundred and five injured at a soccer match by a suicide bomber at a stadium thirty kilometres from Baghdad. On 27th March Tony Blair was back giving his views. (4) They broadly include invading Iraq, Syria and Libya to save Europe from ISIS, remarking of ISIS: “… This ideology is not interested in coexistence. It does not seek dialogue but dominance”, said the man who was interested in neither and enjoined a “Crusade” – an equally thousand year outdated fundamentalism. Anyone who listens to the advise of the author who did so much to spawn the horror, genocide, destruction, insanity, barbarism and should be facing a war crimes Tribunal for his part in bringing the all about, is arguably certifiably insane. Talking of insanity, the UN has designated 20th March as International Day of Happiness, a day founded to recognize happiness as a “fundamental human goal.” Tell that to the people of Iraq.